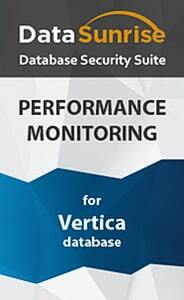 DataSunrise Database Performance Monitoring for Vertica is dedicated to offering a complete overview of database performance that will become helpful means for DBMS process evaluation, operating delay assessment, bottleneck identification, debugging of applications and development and elimination of any possible obstacles that prevent Vertica from operating normally. Query log examination. A developer is able to spot redundant or unexpected queries. Query response log examination. Its effectiveness may be esteemed in determining malfunctions of an application, when its logging is not enough and an additional one is required or logging cannot be added to the application. Tracking of query execution time and query change dynamics in time. Evaluation of query types (i.e. INSERT/UPDATE/DELETE/SELECT) and their execution frequency. Determination of row number in INSERT/UPDATE/DELETE/SELECT operations and their change in time illustrated in diagrams. Identification of the operation number per second. With DataSunrise Database Performance Monitoring Software you are completely confident you have accurate and deep understanding of Vertica processes sufficient to troubleshoot any malfunctions.